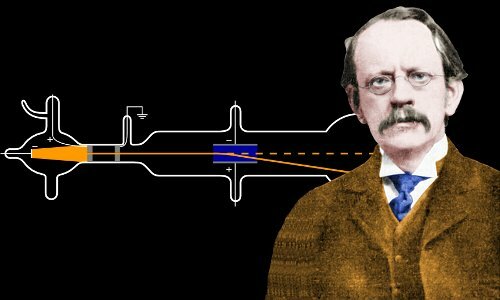 J. J. Thomson took science to new heights with his 1897 discovery of the electron – the first subatomic particle. He also found the first evidence that stable elements can exist as isotopes and invented one of the most powerful tools in analytical chemistry – the mass spectrometer. Joseph John Thomson was born on December 18, 1856 in Manchester, England, UK. His father, Joseph James Thomson, ran a specialist bookshop that had been in his family for three generations. His mother, Emma Swindells, came from a family that owned a cotton company. Even as a young boy Joey, who would later be known as J. J., was deeply interested in science. At the age of 14 he became a student at Owens College, the University of Manchester, where he studied mathematics, physics and engineering. A shy boy, his parents hoped he would become an apprentice engineer with a locomotive company. These hopes were dashed, however, with the death of his father when J. J. was 16. The fees for engineering apprenticeships were high, and his mother could not afford them. This misfortune ultimately benefited science because J. J. needed to find funding to continue his education. In 1876, age 19, he won that funding, not in engineering, but in mathematics at the University of Cambridge. Four years later he graduated with high honors. Thomson continued studying at Cambridge, and in 1882 he won the Adam’s Prize, one of the universities most sought after mathematics prizes. In 1883 he was awarded a master’s degree in mathematics. Thomson was pushing his powerful mathematical mind towards a deeper understanding of matter. In addition to atoms, Thomson began to take a serious interest in James Clerk Maxwell’s equations, which had revealed electricity and magnetism to be manifestations of a single force – the electromagnetic force – and had revealed light to be an electromagnetic wave. In 1834 Michael Faraday had coined the word ion to account for charged particles that were attracted to positively or negatively charged electrodes. So, in Thomson’s time, it was already known that atoms were associated in some way with electric charges, and that atoms could exist in ionic forms, carrying positive or negative charges. For example, table salt is made of ionized sodium and chlorine atoms. In 1891 George Johnstone Stoney had coined the word electron to represent the fundamental unit of electric charge. He did not, however, propose that the electron existed as a particle in its own right. He believed that it represented the smallest unit of charge an ionized atom could have. Atoms were still regarded as indivisible. In 1897, age 40, Thomson carried out a now famous experiment with a cathode ray tube. A cathode ray tube, similar to that used by J. J. Thomson. The air in the tube is pumped out to create a vacuum. Electrons are produced at the cathode by a high voltage and travel through the vacuum, creating the green glow when they strike the glass at the end. Here a metal cross casts a shadow, establishing that the electrons are traveling in straight lines. Image by Zátonyi Sándor. Thomson allowed his cathode rays to travel through air rather than the usual vacuum and was surprised at how far they could travel before they were stopped. This suggested to him that the particles within the cathode rays were many times smaller than scientists had estimated atoms to be. So, cathode ray particles were smaller than atoms! What about their mass? Did they have a mass typical of, say, a hydrogen atom? – the smallest particle then known. To estimate the mass of a cathode ray particle and discover whether its charge was positive or negative, Thomson deflected cathode rays with electric and magnetic fields to see the direction they were deflected and how far they were pulled off course. He knew the size of the deflection would tell him about the particle’s mass and the direction of the deflection would tell him the charge the particles carried. He also estimated mass by measuring the amount of heat the particles generated when they hit a target. Thomson used a cloud chamber to establish that a cathode ray particle carried the same amount of charge (i.e. one unit) as a hydrogen ion. Cathode ray particles were negatively charged. Cathode ray particles were at least 1000 times lighter than a hydrogen atom. Whatever source was used to generate them, all cathode ray particles were of identical mass and identical charge. 2300 years earlier, Democritus in Ancient Greece had used his intellect to deduce the existence of atoms. Then, in 1808, John Dalton had resurrected Democritus’s idea with his atomic theory. By Thomson’s time, scientists were convinced that atoms were the smallest particles in the universe, the fundamental building blocks of everything. 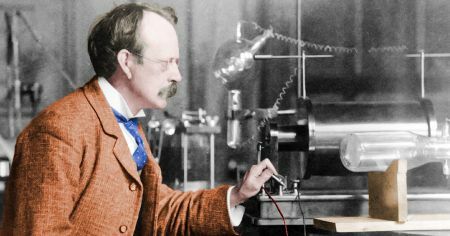 These beliefs were shattered by J. J. Thomson’s experiments, which proved the existence of a new fundamental particle, much smaller than the atom: the electron. The world would never be the same again. Physicists now had an incentive to investigate subatomic particles – particles smaller than the atom. They have done this ever since, trying to discover the building blocks that make up the building blocks that make up the building blocks that make up the building blocks… of matter. Although many building blocks have been discovered, Thomson’s electron appears to be a truly fundamental particle that cannot be divided further. Thomson was awarded the 1906 Nobel Prize in Physics for his discovery. J. J. Thomson in his laboratory operating a cathode ray tube. Although a brilliant theorist, a brilliant designer of experiments, and a brilliant interpreter of experimental results, Thomson was notoriously ham-fisted with laboratory apparatus! Based on his results, Thomson produced his famous (but incorrect) plum pudding model of the atom. He pictured the atom as a uniformly positively charged ‘pudding’ within which the plums (electrons) orbited. In discovering the electron, Thomson also moved towards the invention of an immensely important new tool for chemical analysis – the mass spectrometer. At its simplest, a mass spectrometer resembles a cathode ray tube, although in the case of the mass spectrometer, the beam of charged particles is made up of positive ions rather than electrons. These ions are deflected from a straight line path by electric/magnetic fields. The amount of deflection depends on the ion’s mass (low masses are deflected more) and charge (high charges are deflected more). By ionizing materials and putting them through a mass spectrometer, the chemical elements present in the material can be deduced by how far their ions are deflected. In 1907 Thomson established using a variety of methods that every atom of hydrogen has only one electron. Although Thomson had discovered the electron, scientists still had a long way to go to achieve even a basic understanding of the atom: protons and neutrons were yet to be discovered. Despite these obstacles, in 1912 Thomson discovered that stable elements could exist as isotopes. In other words, the same element could exist with different atomic masses. Thomson made this discovery when his research student Francis Aston fired ionized neon through a magnetic and electric field – i.e. he used a mass spectrometer – and observed two distinct deflections. Thomson concluded that neon existed in two forms whose masses are different – i.e. isotopes. Aston went on to win the 1922 Nobel Prize in Chemistry for continuing this work, discovering a large number of stable isotopes and discovering that all isotope masses were whole number multiples of the hydrogen atom’s mass. In 1890, age 33, Thomson married Rose Elizabeth Paget, a young physicist working in his laboratory. She was the daughter of a Cambridge medical professor. The couple had one son, George, and one daughter, Joan. Humble and modest, with a quiet sense of humor, would probably be the best words to summarize Thomson’s personality. Although scientific research consumed most of his time, he liked to relax cultivating his large garden. Despite his modesty he became Cavendish Professor of Experimental Physics at Cambridge – a role first held by James Clerk Maxwell – at the age of just 27. In his role as Cavendish Professor, he would often sit doing calculations in the very chair Maxwell himself had once occupied. As Cavendish Professor, in addition to making remarkable discoveries himself, he paved the way to greatness for a significant number of other scientists. In fact, a remarkable number of Thomson’s research workers went on to become Nobel Prize Winners, including Charles T. R. Wilson, Charles Barkla, Ernest Rutherford, Francis Aston, Owen Richardson, William Henry Bragg, William Lawrence Bragg, and Max Born. 31 years after Thomson was awarded his Nobel Prize his son George won the same prize in 1937. George’s prize was also for work with electrons, which he proved can behave like waves. Thomson was knighted in 1908, becoming Sir J. J. Thomson. J. J. Thomson died at the age of 83, on August 30, 1940. His ashes were buried in the Nave of Westminster Abbey, joining other science greats such as Isaac Newton, Lord Kelvin, Charles Darwin, Charles Lyell, and his friend and former research worker Ernest Rutherford. Images of scientists on this page digitally enhanced and colorized by this website. © All rights reserved. "J. J. Thomson." Famous Scientists. famousscientists.org. 27 Jul. 2015. Web. Proceedings of the Physical Society, 53 iii, 1942. Cathode Ray Tube by Zátonyi Sándor, Creative Commons Attribution-Share Alike 3.0 Unported.